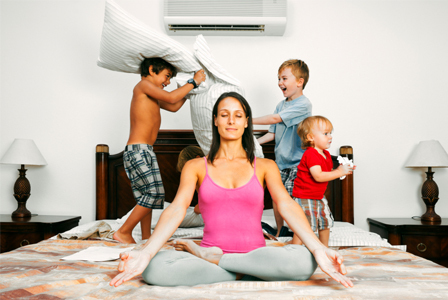 Moms are conditioned by society to be tireless warriors for their kids, but what your child needs most is a well-rested and reasonably balanced mommy. Provide yourself with self-care so you can put your best foot forward. It doesn’t take a rocket scientist to know that mothers across the U.S. are stressed out and overworked. According to U.S. News & World Report, women tend to work slightly fewer hours at the office than men, but we log long and arduous hours in housework, cooking, household management and child care. Needless to say, the combination of hours spent on career and hours spent managing a home can take a toll on women over time. But what’s really at stake with a full schedule? A lot more than you might think. Chronic stress from a jam-packed schedule can result in disease, chronic headaches, fatigue, mental health issues, weight gain and marriage and interpersonal problems. And frankly, the outcomes of chronic stress won’t help you be a better mommy. One of the best things you can do for your kids is to reduce your stress by providing self-care every week. Self-care, unfortunately, is easier said than done. It’s not like you can quit your job or stop cleaning the house so you can log more hours at the gym or hair salon. You can, however, take important steps to safeguard your health and mental state by implementing small chunks of self-care into your weekly schedule. So what is self-care? Simply put, self-care is a powerful choice to willingly engage in the activities and behaviors that you know are good for you. Self-care isn’t about drinking three glasses of wine at night because you “deserve it.” Instead, it’s actively participating in the behaviors you know you need for your health, even if they’re hard to work into your day. If you’re not sure where to start, here are some ideas for self-care that can reduce stress in just a few minutes a day. Exercising. You don’t have to go on a five mile jog to relieve stress through exercise. If you’re short on time, take a walk for 10 minutes to clear your mind instead. Praying or meditating. Before you drive to pick up your kids from school, pause for a moment in your car. Breathe deeply. Whisper a prayer or just enjoy the silence. Doing this for just five minutes can do wonderful things for the body and mind. Making mindful food choices. When humans are stressed, we tend to load up on carbs and sweets, which can make us feel more lethargic and stressed. Make a choice to eat healthy foods when you’re feeling stressed. Reaching out for support. Call a friend. Girlfriends have a way of re-framing problems and providing wonderful support in the midst of challenges. Either call a girlfriend when you’re feeling down or meet her for a respite from life. Once you know that self-care is important, it’s important to get started with a self-care plan. Put your plan on paper so it doesn’t get lost in the daily shuffle of kid activities and work obligations, and then follow through. Take an inventory. Sadly, many moms are so busy that they can’t even remember the last time they did something nice for themselves. If you’re not even sure what self-care means to you, sit down with a journal and take a self-guided inventory. What do you enjoy doing? What activities make you feel most alive? When do you feel the tension release from your neck and shoulders? Once you answer those questions, you’ll have an idea of which activities to implement into your plan. Ask for support. Unless you’re one of the lucky women with a partner who regularly asks you how he can help, you’ll need to ask for support from your spouse. Explain that you’re exhausted and stressed, and that you really need to take some time for yourself. Ask him if he can assist with child care while you take care of yourself. Make a calendar. If you’re anything like me, your “mommy calendar” spells out exactly what will be accomplished in any given week. Write your self-care plan onto your calendar so you’ll be less likely to talk yourself out of it when obstacles arise. Arrange child care. Sometimes husbands, boyfriends or partners aren’t available to help with child care when you need self-care the most. That’s OK — you still need it. Arrange child care and realize that the money you spend on self-care is money well spent. Once you implement your self-care plan, you’ll likely feel better equipped to manage the challenges of child rearing. Not only that, your kids will have an excellent role model for what it looks like to care for themselves as they grow older.